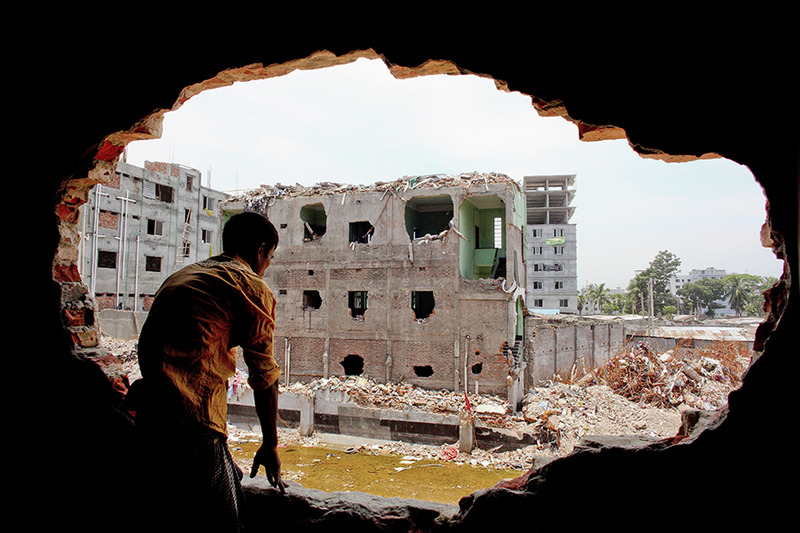 Just before 9 a.m. on April 24, 2013, the eight-story Rana Plaza came crashing down. The building, in the Savar area outside Dhaka, the Bangladesh capital, contained five garment factories on its upper floors. These supplied clothes to well-known fashion brands around the world. A government inspector had ordered the Rana Plaza’s evacuation the previous day after large cracks had appeared in the walls. But on the morning of the collapse, factory managers persuaded and cajoled workers to return, telling them it was safe. In some cases managers threatened them with dismissal if they did not comply. Shortly afterwards, Savar was affected by a power cut. Once the Rana Plaza’s electrical generators were switched on, the building started to shake and then collapsed. More than 1,100 people were killed and over 2000 were grievously injured. 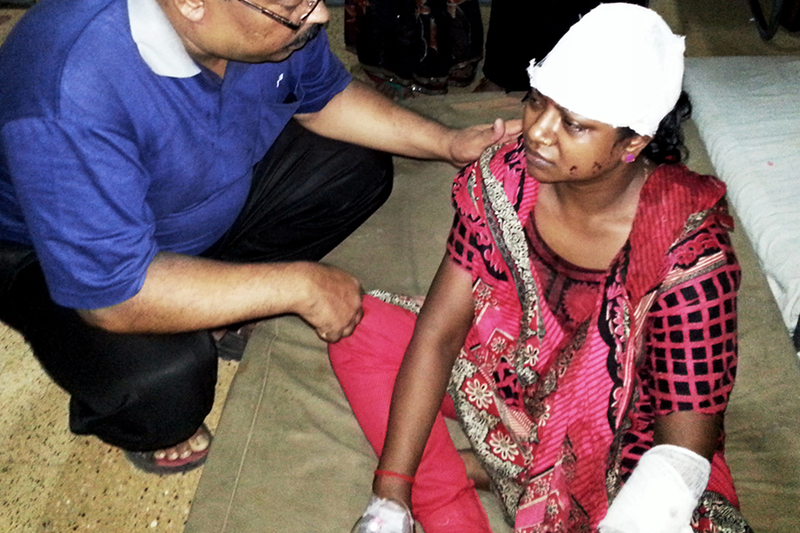 “I was beaten with metal curtain rods in February when I was pregnant ...” — Union treasurer who was later fired, Dhaka, June 24, 2014. The Rana Plaza collapse was the biggest disaster ever to hit Bangladesh’s garment export industry— the second largest in the world after China’s—but it came closely on the heels of another major calamity. Just five months earlier, 112 garment workers had died and several hundred had been injured in a fire at the Tazreen Fashions factory, the most deadly of a series of factory fires that have killed dozens of other garment workers and left hundreds or more injured in recent years. In the two years since the Rana Plaza collapse, a huge effort has been put into making Bangladesh’s garment factories safer. 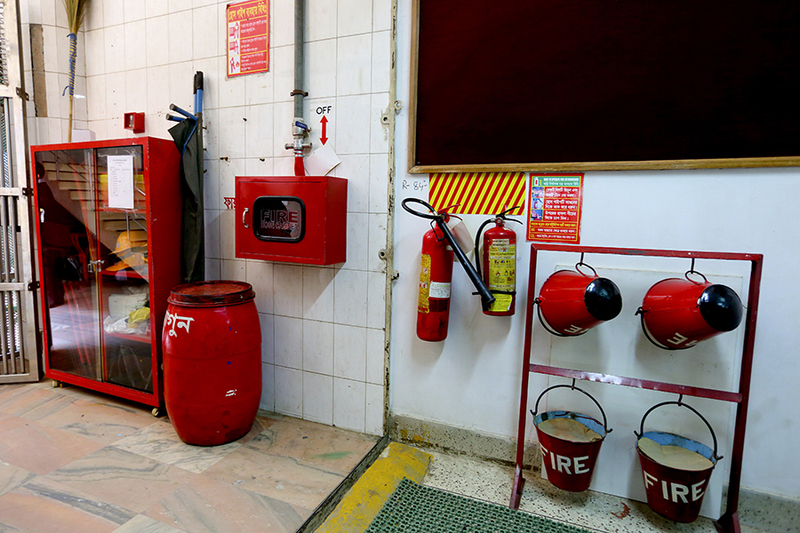 In light of the recent calamities, the focus on physical factory safety is both understandable and vitally important. If the Bangladesh government, factory owners, foreign retailers, and donors are to truly address worker safety and well-being, however, they need to go much further. Real and sustained worker safety requires respect for workers’ rights and an end to mistreatment. 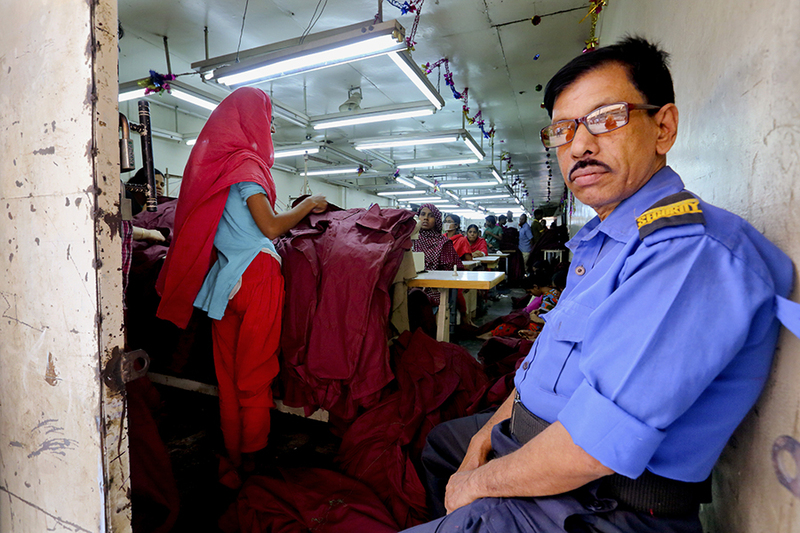 Improved workplace conditions and respect for workers’ rights, including their right to form trade unions, are essential both in their own right and because such reforms can help prevent disasters such as those that befell workers at the Rana Plaza factories and Tazreen Fashions. 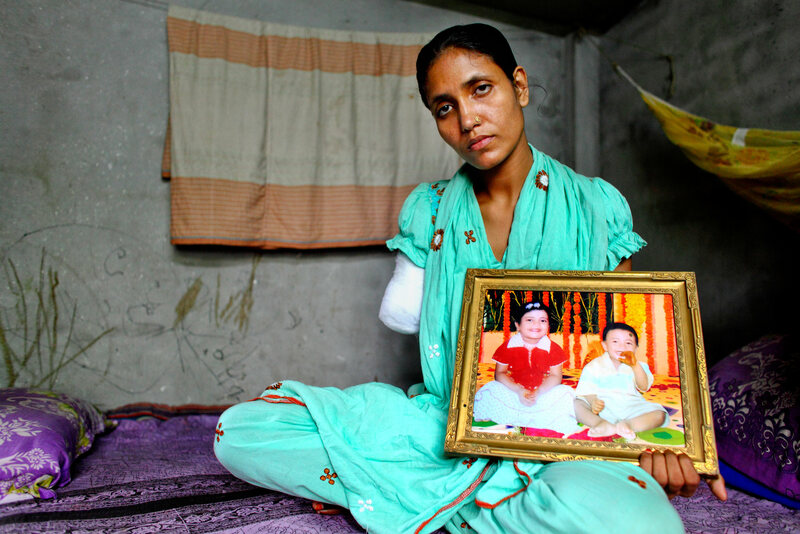 If workers at Rana Plaza had more of a voice, it is entirely possible that the circumstances that led to the thousands of deaths and injuries could have been prevented. None of the five factories operating in Rana Plaza had a trade union, and so workers were powerless to resist their managers who ordered, threatened, and cajoled them to enter the doomed building a day after large cracks had appeared in it. Similarly, workers at the Tazreen Fashions factory were prevented from leaving their workstations by managers, even after the ground floor of the building caught fire and alarms went off. If the workers at Tazreen had been members of an effective union it is much more likely that staff would have had fire safety training and could have pointed out safety violations like blocked stairwells, lack of fire escapes, and barred windows, all of which contributed to worker deaths. 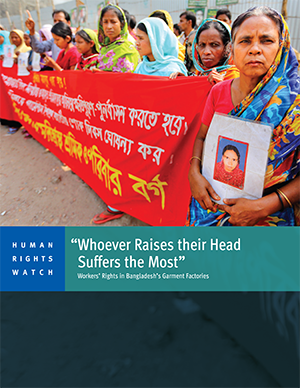 This report documents continuing violations of garment workers’ rights in Bangladesh, details recent allegations of illegal anti-union tactics by managers, including assaults on union organizers, and shows the inadequacy of efforts to date to compensate victims of the Rana Plaza collapse and Tazreen Fashions fire. It also examines why recent government reforms and company interventions have not been sufficient to remedy the problems. It concludes with recommendations on what can be done to ensure enhanced respect for workers’ rights in Bangladesh, including measures that will contribute to improved factory safety. In our research, we interviewed more than 160 workers from 44 factories, including workers from factories employing thousands of workers and from small units employing only a few dozen people. Almost all of the factories make garments for well-known retail companies in North America, Europe, and Australia. Violations of workers’ rights were a problem in nearly all of the factories and included practices contrary to both national Bangladeshi law and codes of conduct that western retailers insist, often in production contracts, that their suppliers follow. Specific violations documented here include physical abuse as well as verbal abuse which is sometimes of a sexual nature, forced overtime, denial of paid maternity leave, failure to pay wages and bonuses on time or in full, pressures on workers not to use the toilet, and provision of dirty drinking water. If we are not able to fulfill the production target, they deduct from our salaries. They also deduct our overtime or show less attendance than is true. Sometimes when the management is angry they throw clothes at us. If our male colleagues stand up for us, then the management hires local thugs to beat them up. 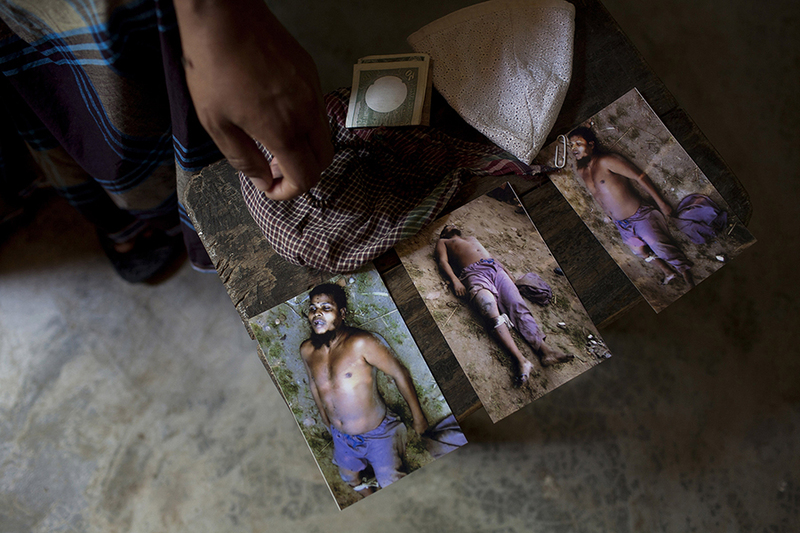 But those attempting to organize unions in Bangladesh face potentially serious reprisals. 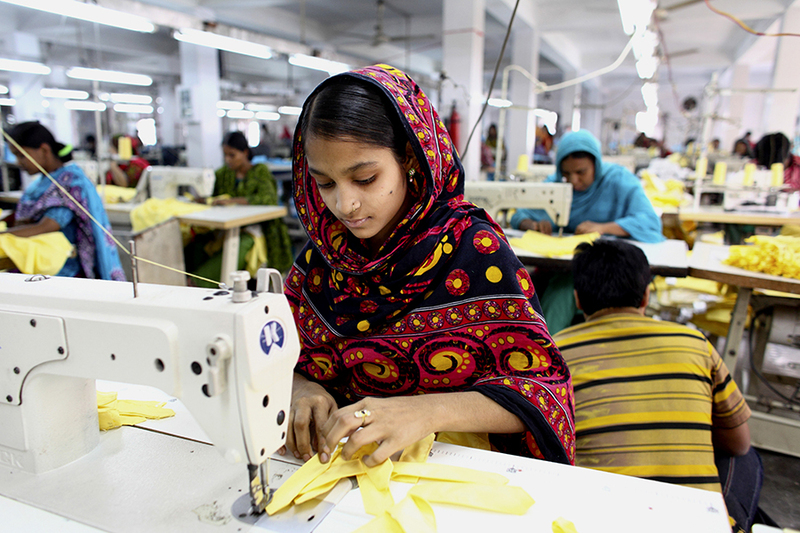 While attention has been paid to post-Rana Plaza improvements in government responses in some cases and changes to some labor laws, including provisions easing the union registration process and facilitating registration of unions, even after the recent changes less than 10 percent of garment factories in Bangladesh have unions. And union leaders continue to be targeted. As one leader we spoke to put it: “Whoever raises their head suffers the most.” Violations include physical assaults on union organizers by both managers and thugs (“mastans”) acting at their behest, threats and multiple forms of harassment, and dismissal of union members. The union organizer said that when she and others tried to set up a union in January 2014, organizers were brutally assaulted and scores of workers fired. She was beaten while pregnant, forced to work at night, and eventually fired, without receiving all the back wages she was owed. The other workers still in the factory are saying to us, ‘See you were trying to form a union in the factory and now you’re out, so why should we want to form a union?’ What we see is the government gave permission to form a union in the workplace but then they do not back up their commitment. Factory owners want to maximize profits, so they will cut corners on safety issues, on ventilation, on sanitation. They will not pay overtime or offer assistance in case of injuries. They push workers hard because they don’t want to miss deadlines and end up paying for air shipment which can destroy the viability of the operations. Workers have no unions, so they can’t dictate their rights…. Some of this can also be blamed on the branded retailers who place bulk orders and say ‘Scale up production lines because it is a big order, and improve your margins.’ Even 2-3 cents can make the difference, but these companies don’t want to factor in [labor rights and safety] compliance into costing. The primary responsibility for protecting the rights of workers rests with the Bangladesh government. 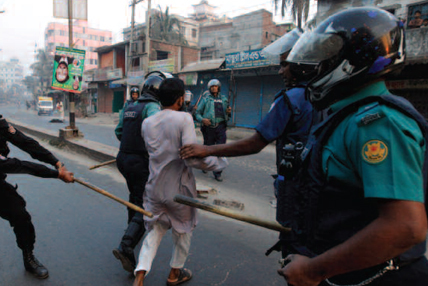 While Bangladeshi law, despite recent reforms, still falls short of international standards in important respects, rigorous enforcement of existing law would go a long way toward ending impunity for employers who harass and intimidate both workers and local trade unionists seeking to exercise their right to organize and collectively bargain. 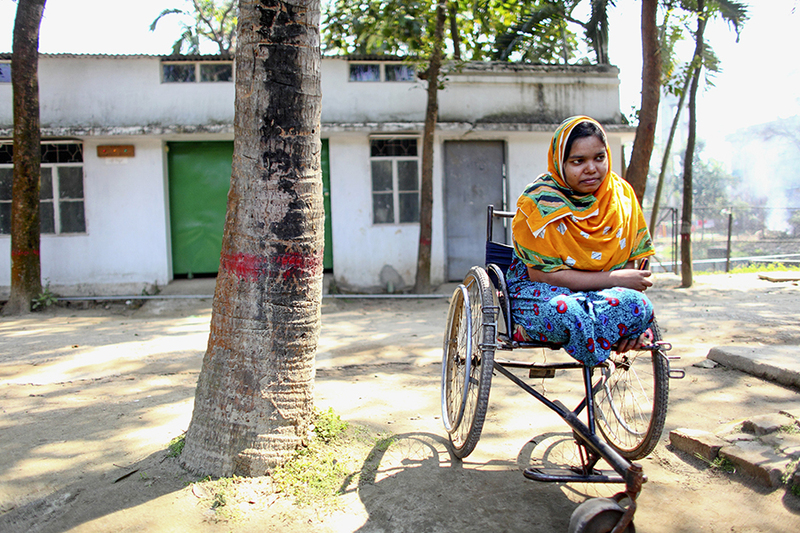 Section 195 of the Bangladesh Labor Act, 2006 (amended 2013) outlaws numerous “unfair labor practices.” For example, no employer shall “dismiss, discharge, remove from employment, or threaten to dismiss, discharge, or remove from employment a worker, or injure or threaten to injure him in respect of his employment by reason that the worker is or proposes to become, or seeks to persuade any other person to become, a member or officer of a trade union.” Bangladesh has also ratified International Labor Organization (ILO) conventions 87 and 98 on freedom of association and collective bargaining, and is required to protect the rights contained in them. Many national and international companies with business activities in Bangladesh are failing to meet these responsibilities. The final chapter of this report examines the failure of all actors involved in the Bangladesh garment industry to adequately support the victims of the April 2013 collapse of Rana Plaza and the deadly fire at the Tazreen Fashions factory in November 2012. Survivors we spoke with said the compensation they have received until now was not sufficient to pay their medical bills and cover their loss of livelihood; many continue to suffer from their injuries, moreover, and the costs continue to mount. In January 2014, the Rana Plaza Donors Trust Fund, chaired by the ILO, was set up. Composed of Bangladesh officials and representatives of the garment industry (both domestic and international), trade unions, and non-governmental organizations, the fund seeks to ensure “a systematic and transparent claims process.” It has paid the first installment, about 40 percent of the total compensation due to each victim, with the rest to be paid depending on future contributions. Many international retailers have paid into the fund, including some that did not do business with the Rana Plaza factories. 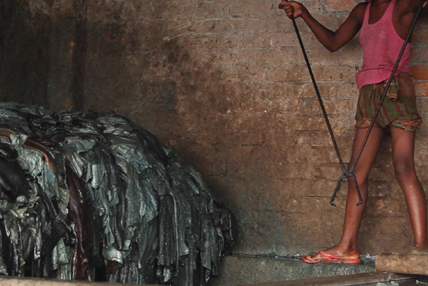 Other retailers connected to Rana Plaza, however, have not donated at all, or donated relatively small sums. In April 2014, Human Rights Watch wrote to the companies that have not paid into the fund. Among those that replied, some said they have given money directly to NGOs or other groups supporting victims instead of the ILO-chaired fund. Others denied they were doing business with the Rana Plaza factories, or that suppliers had done so without permission. While some observers have suggested that the Rana Plaza fund could be a model for responses to future industrial disasters in Bangladesh and elsewhere and while some aspects of how the fund was established and managed are indeed worthy of emulation, the fund should not be seen as a success or a model unless and until it is replenished and full compensation is paid to claimants. Claiming that the Rana Plaza accident had served as a “warning,” Commerce Minister Tofail Ahmed claimed in December 2014 that the government was undertaking a series of reforms to try and make “the Bangladesh apparel sector the world’s number one.” If this promise is to become a reality, far more needs to be done, starting with rigorous enforcement of existing labor laws. The government and the factory owners associations, the BGMEA and the BKMEA, have recently conducted some mediation to settle disagreements after attacks on activists or union workers, but they should also insist that members comply with labor laws and sanction member companies that abuse worker rights. 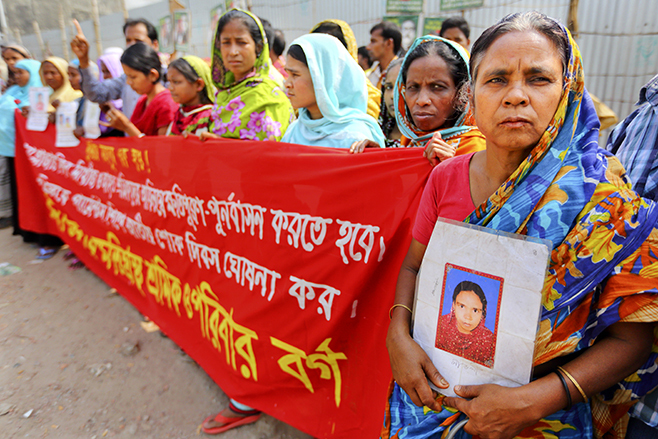 Since the Rana Plaza accident, government inspectors, supported by the ILO and funded by the EU, have been inspecting and overseeing improvements in some 1500 factories, but the government needs to ensure that this is a routinely robust and transparent process. The Accord on Fire and Building Safety, run on behalf of 175 retailers, most of which are based in Europe, and the Alliance for Bangladesh Worker Safety, a group of 26 North American retailers, are conducting a series of inspections. Retailers should ensure that the outcomes are properly monitored. Workers in factories told Human Rights Watch that many abuses and violations are simply not noticed, or are ignored, by the inspections carried out by or on behalf of buyers. Most trade union leaders said that freedom of association and collective bargaining are part of company codes of conduct but in their experience audits and inspections conducted by company agents prior to the Rana Plaza collapse often overlooked these issues or addressed them only superficially. A factory owner told Human Rights Watch that prior to the Rana Plaza disaster safety inspections were primarily intended to just make factories “look good on paper” rather than ensure safety for workers. The owner added that inspectors hired by western companies frequently asked that factory owners make safety improvements, but then failed to ensure the required remedial work was carried out. Pressure from buyers can push factory owners to respect workers’ rights, including freedom of association, and stop illegal anti-union activities. Some brands temporarily suspended orders from the Azim Group in late 2014 after finding out about anti-union activities in two of its factories. In February 2015, managers agreed to recognize and bargain with unions, reinstate several union officials with full back pay, and pay medical bills for Meera Basak, a union leader who was badly beaten allegedly at the direction of factory management. 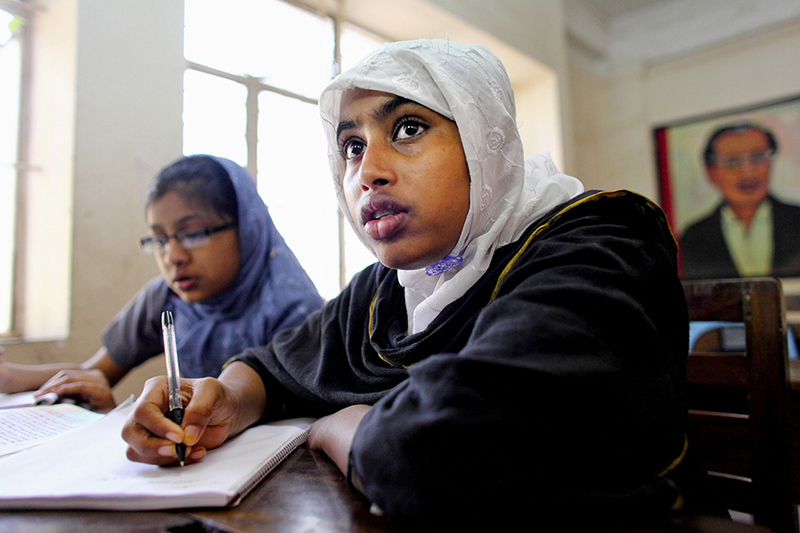 Western companies, foreign donor agencies, the Bangladesh government, factory owners, trade unions, and civil society groups are working together to ensure that Bangladesh’s factories become safer. That effort will not be complete if it does not include working together to promote and protect the rights of Bangladesh’s workers. The Bangladesh government should revise the labor law to ensure it is in line with international labor standards. Amendments made to date fall short of International Labour Organization’s conventions ratified by Bangladesh, including Convention No. 87 on freedom of association and Convention No. 98 on the right to organize and bargain collectively. Companies sourcing from Bangladesh factories should institute regular factory inspections to ensure that factories comply with companies’ codes of conduct and the Bangladesh Labor Law. Companies should work in consultation with unions and labor rights lawyers to ensure that pricing and sourcing contracts adequately reflect and incorporate the cost of labor, health, and safety compliance. Such contracts should include the cost of the minimum wage, overtime payments, and all legal benefits.